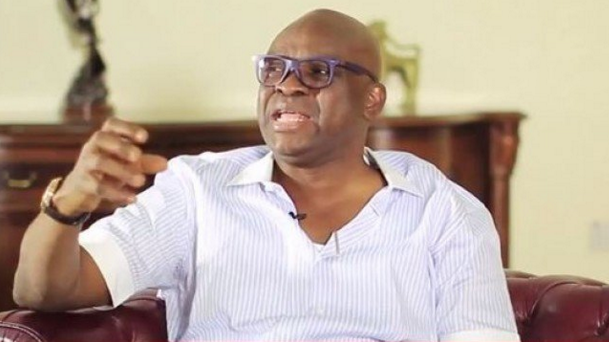 Governor of Ekiti State, Ayodele Fayose has challenged President Muhammadu Buhari to call him if he is indeed hale and hearty. In a statement by his Chief Press Secretary, Idowu Adelusi, Fayose picked holes in the statements that Buhari had spoken in one week, first with the king of Morocco and next with the president of the African Union. ” I advised the President to speak with me for the purpose of convincing Nigerians that he is hale and hearty instead of looking for people outside the country to convince Nigerians.” “If their problem is that they are looking for a credible person who can help them convince Nigerians that all is well with our President, Ayo Fayose is their best bet. Let the president speak with me. If I tell Nigerians that the president spoke with me, Nigerians will believe”, he said. Since they are eager for the president to speak to people; believing in this way to convince Nigerians that their President is hale and hearty, let President Buhari talk to me. I can be reached on 08035024994. I am credible and Nigerians will believe me”, he said. “They said he spoke to President Donald Trump; despite the hype, Nigerians were sceptical. Then they said he spoke to the king of Morocco; again, Nigerians were suspicious. Before we recovered from that, it is now the AU president that they said President Buhari spoke to. “A president that can speak with outsiders should be able to whisper or wave to his own people. The people gave him the very important platform of President on which he stands today and, therefore, Presidential aides should stop giving the unhelpful impression that Buhari has no respect for the Nigerian electorate."